YOU KNOW WHAT’S FUNNY? When Walter Bolzonella was invited to meet Belmond Hotel Cipriani’s revered head barman, to interview for the position of assistant barman back in 1979, he wasn’t interested. A fresh-faced 23-year old, Bolzonella wanted to travel around Europe instead. His exasperated boss at the Cristallo Hotel in Cortina, Italy, said, “You are crazy! Do you know the Cipriani?” “No,” said Walter. So, after hearing about the Hotel Cipriani’s unrivalled international reputation he went to Venice. 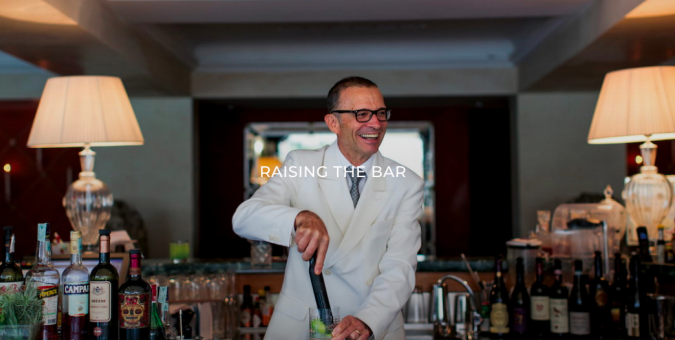 What’s so pleasing about the story is that thirty-nine years later, Walter is not only the hotel’s head barman—he’s the beating heart of Belmond Hotel Cipriani. The guests, in turn, love Bolzonella. Over the past decade, he has created not one but two cocktails at the Cipriani with the actor George Clooney; the Buononotte, for Clooney’s film Goodnight and Good Luck, and La Nina, for the star’s mother. Their rapport is such that when Clooney and his then-fiancé, Amal Alamuddin, arrived at the Cipriani before their wedding in 2014, Amal came to see Bolzonella at the bar before the pair went up to their room. “She asks me, ‘Are you Walter? I think you are Walter, because George talks about you.’” Bolzonella is clearly very touched. “This was really wonderful,” he says. If he’s been asked about his famous guests a hundred times, he doesn’t show it. He is still tickled when recalling the time he served a martini (of sorts) to Elizabeth Taylor’s fluffy white dog, Sugar, on a hot day (the pure water was of course presented to the pup in a Murano glass). On another occasion, a discrete search party was sent to the ladies’ washrooms for Taylor’s famous Krupp Diamond ring; “When she saw her hand without the ring, she became white,” says Bolzonella. The ring was duly recovered. But what about when Walter is not at work? What does he love doing away from the bar? Well, when he gets back to his house in the Venetian countryside, he likes to spend time in his garden with a watering can, tending and speaking to the flowers. “It relaxes me!” he says, happily. But of course. This entry was posted in Miscellany and tagged Belmond, Content, Copywriting, Food and Drink, Suitcase, Suitcase Media, Travel, Venice. Bookmark the permalink.